Line 2 cookie sheets with waxed paper. In small saucepan, melt vanilla chips over low heat, stirring constantly. Using 6 pretzels, form a circle on waxed paper-lined cookie sheet, placing side of pretzel with 1 hole on outside of ring. Remove 1 pretzel from circle; dip inner section (side with 2 holes) halfway into melted vanilla chips. Place dipped pretzel back into circle formation. Continue with remainingpretzels in circle. 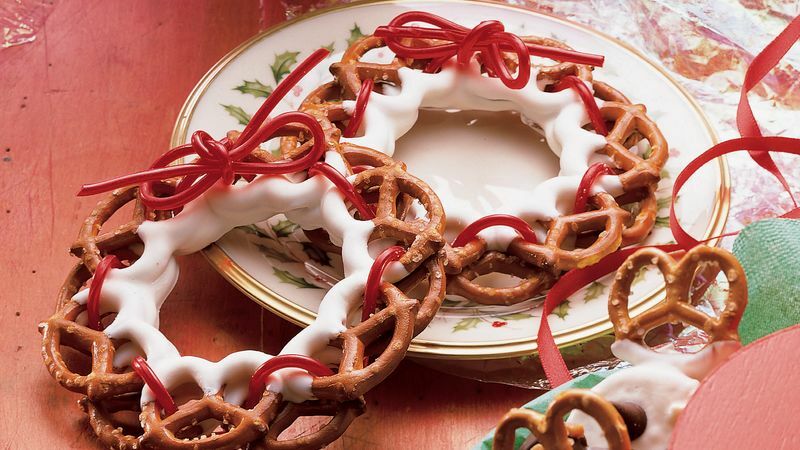 To form top layer of wreath, dip 6 additional pretzels, one at a time, in coating. Place over first circle so that coated holes overlap 2 pretzels. Repeat to make 5 additional wreaths. Refrigerate wreaths 15 minutes or until coating is firm. Weave 1 piece of string licorice through coated holes in each pretzel. Tie bow with licorice ends. 1. MICROWAVE DIRECTIONS: Line 2 cookie sheets with waxed paper. Place vanilla chips in 2-cup microwave-safe measuring cup. 2. Microwave on MEDIUM for 2 to 3 minutes or until melted, stirring once halfway through cooking. Stir until smooth. Continue as directed above.